During the war military authorities had occasionally allowed grieving relatives to visit the graves of their family members but this was only possible if the fighting was sufficiently far away for there to be no danger. At the end of the war it became obvious that people would wish to visit the battlefields, and not just those tourists who had a burning desire to see the places where the action took place, but also for those families who had lost relatives in the mud of Flanders and who wanted to pay their respects. The first tourists started to visit the battlefields as early as 1917. Michelin, the road map and tyre manufacturers, published its first Illustrated Michelin Guide to the Battlefields about the Marne (6-13 September 1914). 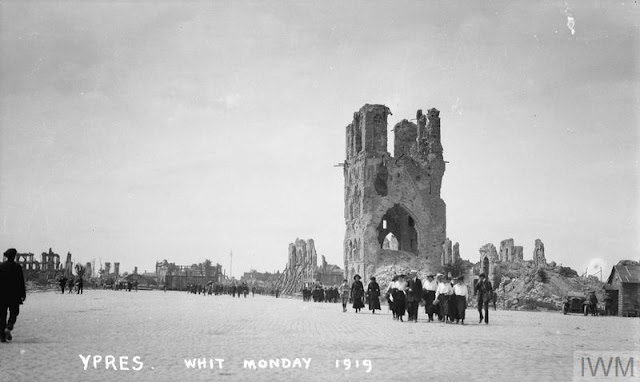 Even with the war raging not very far away tourists wanted to see first hand the devastation and destruction. In 1919, the travel company Thomas Cook started organised trips to the Western Front but travel was expensive and the areas around the battle sites were often impassable. Those visitors who wanted to visit the graves of loved ones had to first obtain a special pass from the Directorate of Graves Registration/Imperial War Graves Commission. By 1918, some 587,000 graves had been identified and a further 559,000 casualties were registered as having no known grave. Church groups and charitable organisations also became involved in helping poorer families, particularly women, to visit the Western Front. The Church Army and the St Barnabas Society would arrange itineraries, meet people at Boulogne and even offer hostel accommodation in disused army huts. 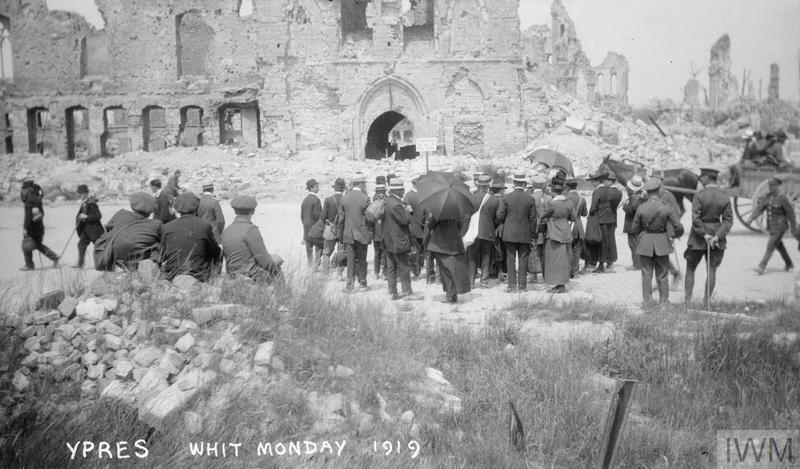 Tourists in Ypres, Whit Monday, 1919. Whit Monday tourists outside the Cloth Hall, Ypres, 1919. The tourist trips were at first thought to be distasteful and disrespectful however, the pilgrimages continued and grew in popularity. They offered a valuable service and brought a much needed boost to the economy as the visitors needed places to stay and they bought food and drink and also souvenirs and mementos to take back home. On the blog yesterday I featured a historical fiction novel, In Love and War by Liz Trenow which focuses on the individual stories of three women who visited the battlefields of Flanders looking for clues about their loved ones.